Posted by OromianEconomist in Dhaqabo Ebba. ODUU GADDAA: OBBO DHAQQABOO EEBBAA DHALATANII WAGGAA 163 ISAANIITTI LUBBUN DHAN BOQOTAN. 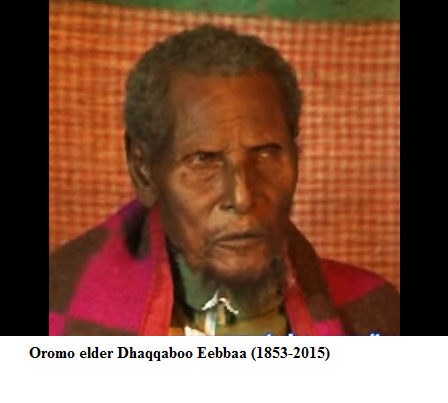 Oromo Elder Dhaqqaboo Eebbaa (1853-2015): The oldest man ever to have lived has died at age of 163. His eldest son Ahmed Dhaqqboo now at age of 128 is the oldest living person on earth. This is the moment of deepest sorrow for Oromo people as they have lost their respected elder, the oldest and one of the richest library. 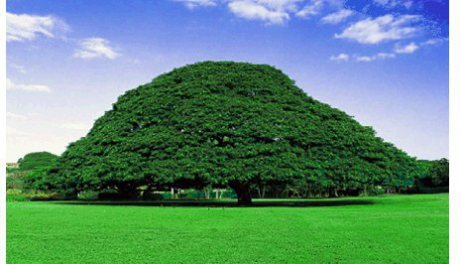 The burial ceremony of Dhaqqaboo Eebbaa was held at his birth place in rural village of Dodolaa District in West Arsi Zone of Oromia State. Dhaqqaboo Eebbaa was born in 1853 in specific rural place called Serufta around Dodolaa town from his father Eebbaa Badhaaso and his mother Washo Kolocho. He passed away on May 10, 2015 at 11: 30 pm. Dhaqqaboo Eabbaa was dubbed by many as a living library of three his centuries with his old memories and knowledge of the social, economic and political history of the people and the country. He had witnessed major historical events in the Oromo nation and North East Africa. Obbo Dhaqqaboo Eebbaa had lived through independent Oromia in the second half of 19th century, witnessed the colonization of his country and nine Ethiopian empire regimes. His eldest son Ahmed Dhaqqboo is now the oldest living person, he is 128 years old. He considered his father as his best friend. Even though the world knows little about the legendary Oromo elder, Obbo Dhaqqaboo Eebbaa will be remembered in recorded Oromo history, by his villagers and the entire Oromo people forever. He is deeply missed. Rest in Peace! Biyyoon isinitti haa salphatu.